THE ALL NEW ADG ALPINE MOUNTAIN SLIDE. 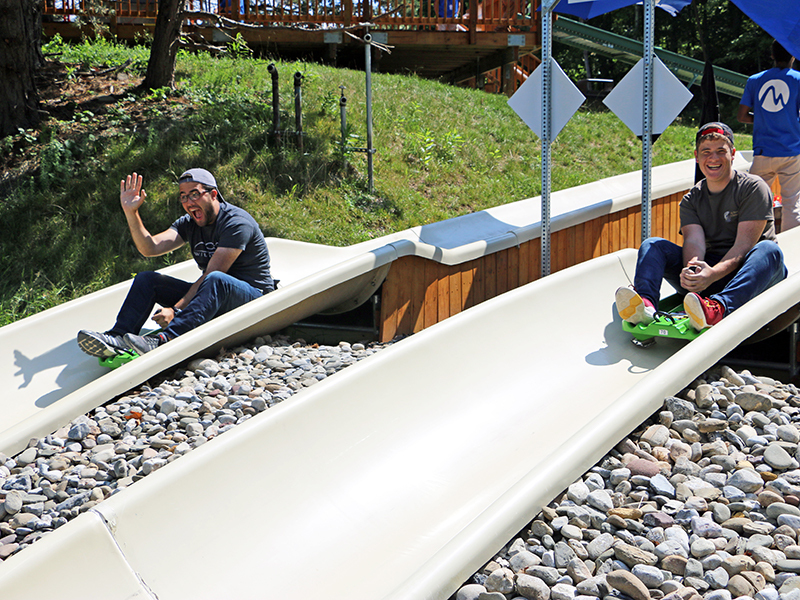 The completely redesigned ADG Mountain Slide takes everything you remember about this universally appealing summer attraction and makes it even better – for your guests and for you. With high revenue capability, modest staffing needs, and an advanced design, the ADG Alpine Mountain Slide provides a quick, proven, safe path to ROI. The all new ADG Mountain Slide is an updated twist on the classic alpine slide. With a new look and innovative safety enhancements, the ADG Slide capitalizes on the excitement of a multi-track, side-by-side downhill adventure that taps in to the natural energy and competitive spirit of your thrill-seeking guests, while rider controls allow guests of all ages to enjoy the ride at their own pace. Advances in track and sled design improve safety and maintenance concerns, setting the gold standard for a new generation in slopeside fun. Non-abrasive fiberglass construction improves track performance while providing a smooth, safe surface that heightens the sensation of speed while eliminating injuries inherent with older poured concrete slides. 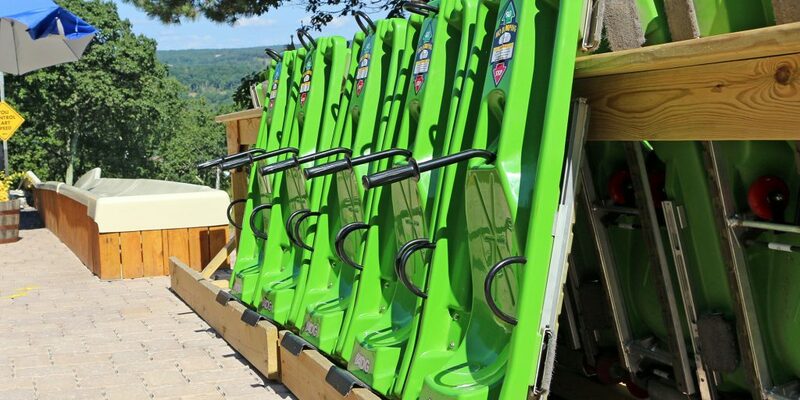 ADG’s revamped Mountain Sled adds rear wheels that follow the curvature of the track and eliminate ‘fishtailing’, while a patented speed restrictor increases guest safety without negatively impacting rider enjoyment. The redesigned track boasts deeper channels that also greatly improve maneuverability and rider control. ADG’s Alpine Mountain Slides require minimal maintenance, and both our in-ground and above-ground solutions can accommodate a variety of terrains with low environmental impact. You can easily upgrade older slides in phases as new sections can often easily integrate with existing track layouts. 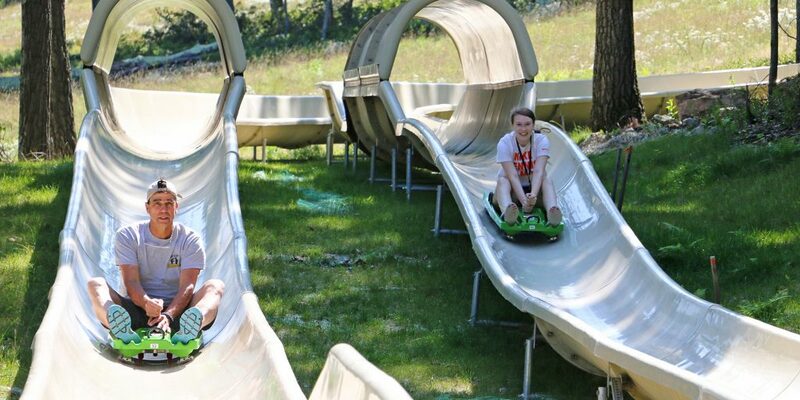 Only ADG offers official Alpine Slide replacement parts and service repairs from expert technicians trained in the install, repair, and replacement of alpine slide tracks and sleds.